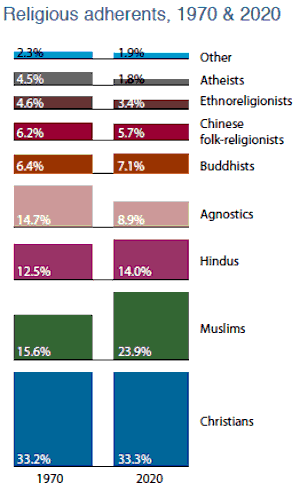 In 1970, nearly 82% of the world’s population was religious. By 2010 this had grown to around 88%, with a projected increase to almost 90% by 2020. This finding contrasts sharply with some in the West who seem to believe that religion is dying. Dr. Rodney Stark, internationally known author, and co-director of the Institute for Studies of Religion at Baylor University is authoring a book entitled “The Global Religious Awakening” because, he says, “there is more religion going on in the world than ever before”. ..there is plenty of evidence to demonstrate that we are today in the midst of a great religious revival. The order of the day is not irreligiousness but religious pluralism. It does not surprise me that the Western press seems unaware of growing religiosity in the world, but it does bother me when missions, missionaries and churches don’t take it into account. Today, most Christians in the world have neighbors who are highly religious. Many live in an environment where there are two or more competing religions. A colleague of mine working overseas sponsored a young man he met to go to Bible School run by a mission agency. When he returned after the first year, my colleague asked him what courses he had taken. The young man responded that he had taken a course in proofs the existence of God. The thing is, everyone that young knows believes in God, even the non-Christians. Here is a young man taking a course in his first year of Bible school that is relevant to the place the missionaries come from, but which is quite irrelevant to his life and ministry. The world in which we are doing mission is a religious world. All Bible translation programs in Africa are carried out in very religious environments. Christian books, TV broadcasts and Bible school courses designed to reach atheists and agnostics are irrelevant in this context. Films like “God is not dead” which address real issues in the West don’t fit the context in which I work, where I would have to search a while to find someone who believes that God is dead, and many don’t even know that some people think God is dead. When Dayle and I were last in the US, we ran into publications and believers talked to us about creationism and intelligent design. That is all well and good, but I meet very few Africans who do not already believe that God created everything. That’s just not an issue here. In addition to the mission field being a very religious place, many Christians around the world live in places where there are two or more competing religions, and quite a number live in places where Christians are a minority. Christianity has been dominant in the West for so long that Western Christians have little practical teaching to offer to believers who live where another religion is the dominant feature on the religious landscape. Let me even suggest that the church in the US is still figuring out how to react to the fact that the majority culture is increasingly hostile to its beliefs and values. If we haven’t figured that out for ourselves, how will we teach others? I had an interesting talk with a church leader in Ghana who told of places where the Bible is now in the language of the people and a good number of Christians have taken literacy classes so that they can read. He said that this results in places where those promoting other religions have no success because of ordinary people who read the Bible for themselves and can therefore explain their faith. Rather than exporting our answers to the issues we face as Western Christians, we need to do mission in a way that is relevant to an increasingly religious world – one where some of the key battles facing the church in the West are not very relevant. Our mission efforts need to help believers develop answers relevant to their environment. The Bible in people’s language is a key resource for that. 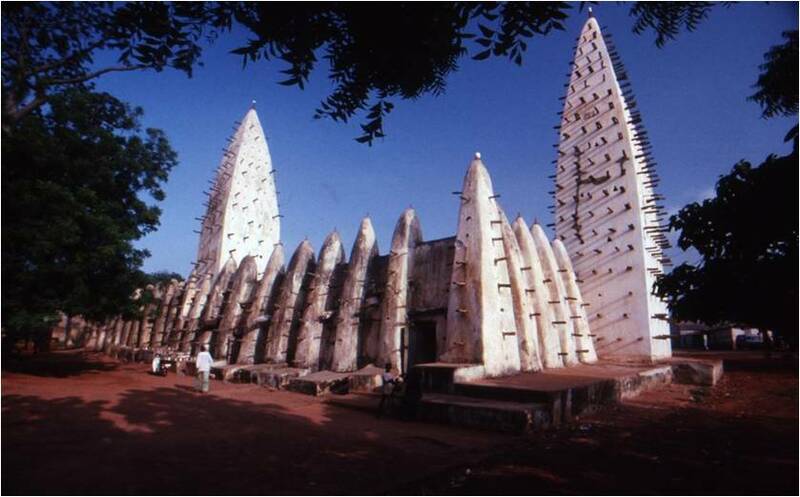 This entry was posted in Africa, Christianity, Faith now, Ghana, Religion and tagged religious diversity. Bookmark the permalink. Hi Ed, Good point, as usual. Friday evening Sandy and I plan to attend a great apologetic film. Living Waters: Intelligent Design in the Oceans of the Earth, on DVD at Lars and Kathy’s. It occurs to me that this would be a great film to show anywhere in the world, not to prove God, but to glorify Him in His creation, and, at the same time, to also impress anyone who has been infected by western/Marxist/Darwinian atheism. In contrast, the US media, including Discover magazine, are continually showing examples of God’s wonders as if they were examples of evolution, in spite of all the evidence that the theory of natural selection is bogus, demonstrating that evolution has become the religion of those who claim they have no religion.